Unit is designed for use in areas with limited space. 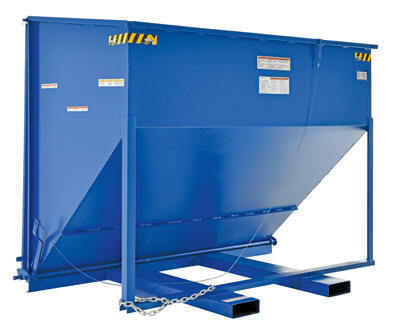 Fixed-position hopper features a full-height front door that opens to dump the hopper contents. Door will automatically close and lock after contents have been dumped. Front door is opened with a release cable that may be operated from a safe distance. Units may be moved with assistance from a fork truck. Safety chain is attached for securing unit to the carriage of fork truck. Welded steel construction with blue painted finish. (lbs) Overall Size (WxDxH) Gauge of Steel Wt.